Bangor Police officers stopped a vehicle on Union Street that resembled a vehicle involved in the robbery at TD Bank on Stillwater Avenue on Sunday. The driver and passenger from Connecticut were later arrested for two robberies in Bangor, the bank on Sunday and at the Dollar Tree on Monday. BANGOR, Maine — The husband and wife accused of robbing a Stillwater Avenue TD Bank branch picked the location because she used to work for the company and is familiar with its policies, police said. Seth Blewitt, 29, and Cara Blewitt, 30, both of Oakville, Connecticut, were ordered held on $50,000 bail at their first appearance before a judge at Penobscot Judicial Center on Tuesday, officials said. The two are charged with stealing $500 from a TD Bank branch on Stillwater Avenue at 12:45 p.m. on Sunday and $400 from a Dollar Tree store also on Stillwater at about 4:10 p.m. on Monday, according to the Blewitts’ arrest warrant affidavits. The Blewitts allegedly admitted to both robberies, describing themselves as heroin users who spent the stolen money on drugs. Cara Blewitt said she drove the Volvo during the robberies, worked as a TD Bank manager in Connecticut and “was aware of their policies and procedures regarding robbery,” her affidavit states. Witnesses reported that the bank was held up by a slender white man about 5 feet, nine inches tall, with dark scruffy facial hair, who came in and demanded money before walking out the front door, the affidavits state. Seth Blewitt allegedly announced the robbery and told a bank teller “to not give him any GPS trackers or dye bags,” according to his arrest warrant. Clerks at the Dollar Tree told police that a man about the same height and weight, but wearing a red mask, sunglasses and carrying a sawed-off shotgun, later walked into the store and demanded money before fleeing, the affidavits state. 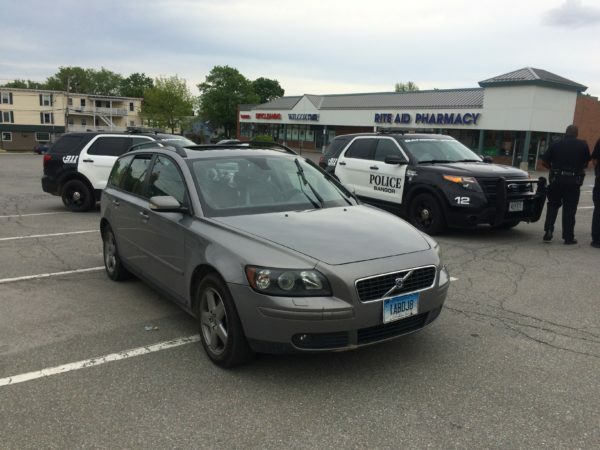 Surveillance cameras near the store and the bank recorded a 2005 Volvo station wagon with Connecticut license plates leaving both places after the robberies. Police matched the Volvo with one recorded by Officer Jeremy Caron’s cruiser camera during a motor vehicle stop on George Street on Sunday afternoon, according to the affidavits. The Blewitts were taken into custody at Third and Union streets on Monday, about 10 minutes after the Dollar Tree robbery, when an off-duty officer reported seeing the station wagon on Park Street, according to the affidavits. Police found clothing discarded during the bank robbery, and the shotgun, where Seth Blewitt said he dumped them, the affidavits state. It was unclear why the Blewitts were in Bangor. A TD Bank spokeswoman said that Cara Blewitt is not currently employed by TD Bank and was not an employee at the time of the robberies. The Blewitts are due in court on July 11. Their lawyers did not respond to messages seeking comment.